was born in 1971 in the magnificent town of Burgas - Bulgaria on the Black Sea coast. 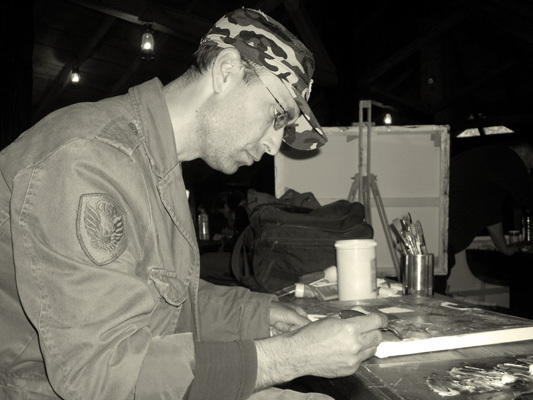 Graduated from the Art School in Burgas, and later in 1994 from the Veliko Tarnovo University "St. St. Cyril and Methodius", speciality Art of Graphics. Since 1991 he has been participating in many national and international group exhibitions and five oneman shows. His art works are a possession of collections in Bulgaria, England, USA, Germany, Belgium, Holland, France, Italy, Austria, Greece. The artist lives and works in the town of Burgas. Jordanov takes his inspiration from the sea and nearest Stranja mountain - full with memories and relics of ancient times. Each of his creations are made with pure heart and mind. Paintings remind people that world is a beatiful place and fill us with love and understandings.